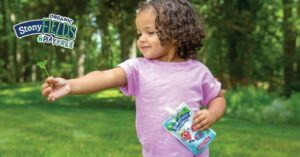 Stonyfield Organic, the US’ leading organic yogurt maker and a mission-led brand known for rewriting the rules to deliver healthy food and a healthy planet, has added some star power to its #PlayFree initiative. In a newly released video, “The Ridiculous New Rules of Soccer” featuring actor Adam Scott, perhaps best known for his role as Ben Wyatt on television’s Parks & Recreation, Scott perfects his working-stiff role as he tries to convince a team of bored kids of the new rules of the game when playing on fields that are treated with toxic persistent pesticides. The video is a humorous look at the serious issue of potentially dangerous chemicals being used on many public parks and fields on which 26 million kids spend time playing. 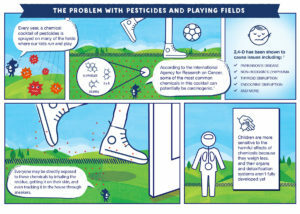 “With each new outlandish work-around to the traditional game of soccer, we’re really trying to point out how crazy it is that a majority of our parks and public fields are being sprayed every day with a chemical cocktail of harmful persistent pesticides,” says Stonyfield co-founder and Chief Organic Optimist Gary Hirshberg. 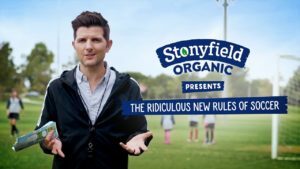 Stonyfield’s #PlayFree initiative, which launches as the brand celebrates its 35th year, will be offering 35 communities across the country expert resources and funding to support the move to organic grounds management. The company recently announced it has already forged partnerships with 10 of those 35 communities, and also announced two donation programs designed to help other communities across the country make the conversion to organic field management.